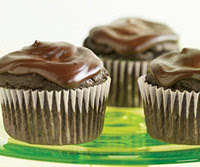 Avocado replaces the eggs and most of the oil in a rich, chocolaty batter that turns out supermoist baked goodies. To make Cupcakes: Preheat oven to 350 degrees F. Line 12-cup muffin pan with paper liners. Whisk together flour, cocoa powder, baking powder, baking soda, and salt in bowl. Puree avocado in food processor until smooth. Add maple syrup, soymilk, oil, and vanilla, and blend until creamy. Whisk avocado mixture into flour mixture. Spoon batter into prepared cupcake cups. Bake 25 minutes, or until toothpick inserted into center comes out with some crumbs attached. Cool. To make Glaze: Blend tofu, maple syrup, vanilla, and salt in food processor until smooth. Add chocolate to tofu mixture and blend until smooth. Transfer to bowl. Dip tops of Cupcakes into Glaze, pulling straight up from Glaze to form peaks. Calories 287, Total Fat 12.5 g, Saturated Fat 3 g, Sodium 304 mg, Carbohydrate 44 g, Fiber 4 g, Protein 4 g, Sugars 24 g.
This entry was posted on 12:40 AM and is filed under Dairy Free . You can follow any responses to this entry through the RSS 2.0 feed. You can leave a response, or trackback from your own site.